Brochures are paper made documents used for advertising. These brochures can be folded over into a pamphlet, leaflet, and templates. Brochures are known as grey literature. The brochures are present mostly at tourist attractions used to initiate introduction of companies, organizations, services and products as well. 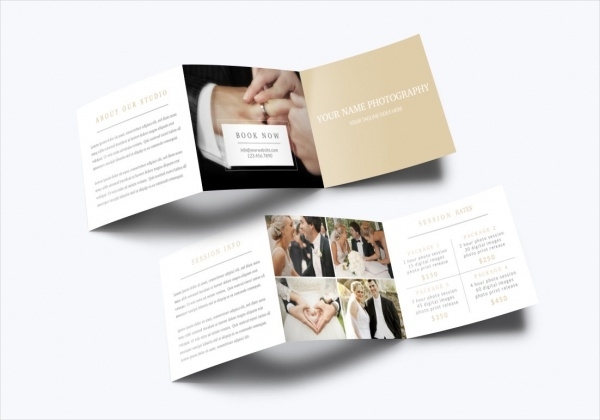 There are single sheet brochures folded into three halves resulting in six sections with three sections on each side of the brochure, known as a tri-fold brochure. A number of Free Brochure Designs are those available free of cost, a variety of designs depending on the color, size, and design are available for use. 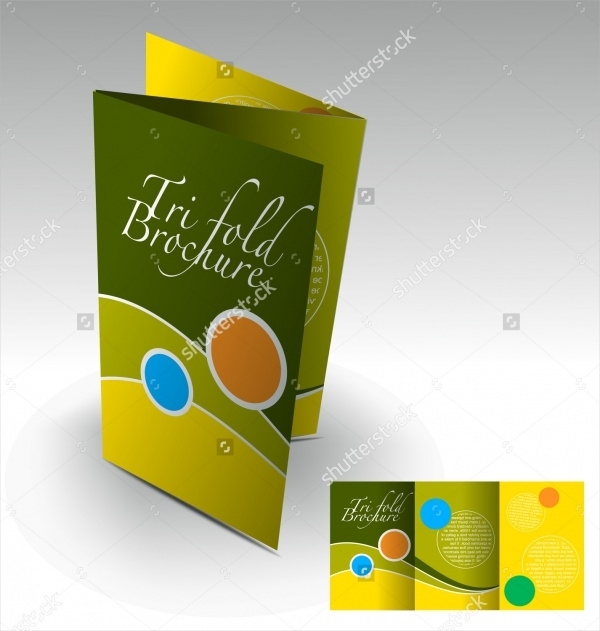 Free Tri-fold Brochure Designs are pamphlets folded thrice with six sections, three on each side. These are for free and available online as E-brochures. The brochures are generally useful on different occasions depending upon the need. Modern in stationery, the tri-fold brochures are a polygon in shape. 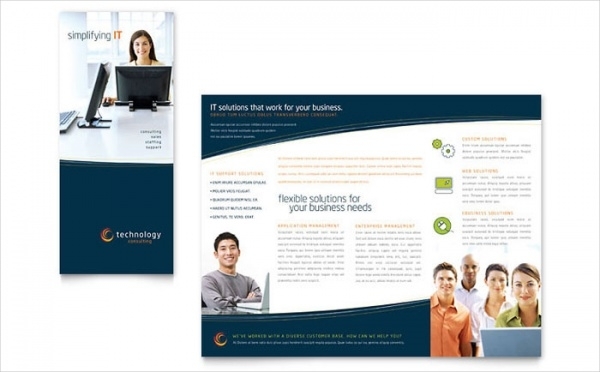 Tri-fold Corporate Brochure is brochures of the size 8.5 x 5.5 inch. The corporate tri-fold pamphlets are modern and useful in the corporate sector in the company and business corporation. There are different kinds of colors and photos available in accordance to one’s need. 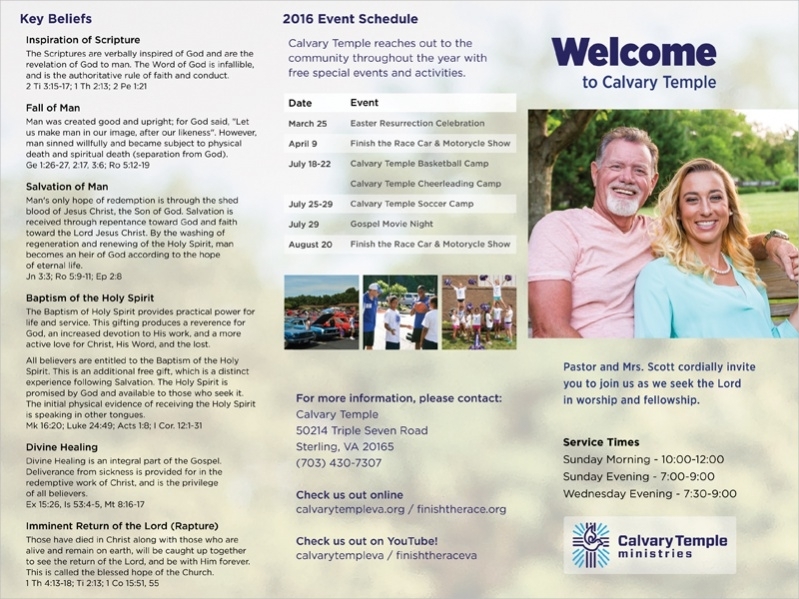 The brochures are available online for free. Church Tri-fold brochure is generally useful for religious ceremonies. The brochure can be of different colors and font. This pamphlet is usually used in Church for conveying the event listings etc. You may also see Spa Brochures. 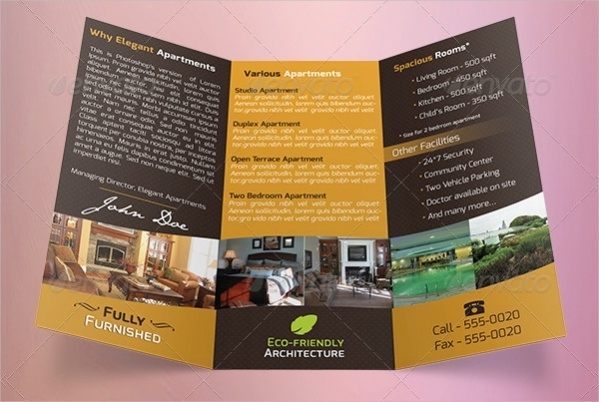 Real Estate Tri-fold brochure is useful for apartment, property, and land. This brochure comes in the standard size of 11 x 8.5 inch. Usually, the brochure includes dual color options and is completely editable. This is a multi purposeful brochure. 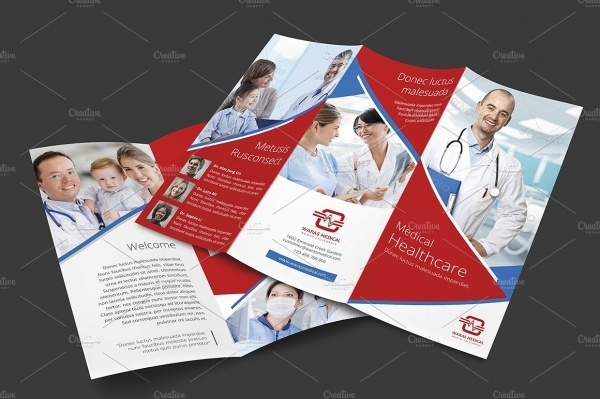 Tri-fold Medical Brochure is useful in hospitals and medical care centers. This brochure is available in the size of A4 210 x 297 mm. The texts are easy to be edited along with well-organized files. 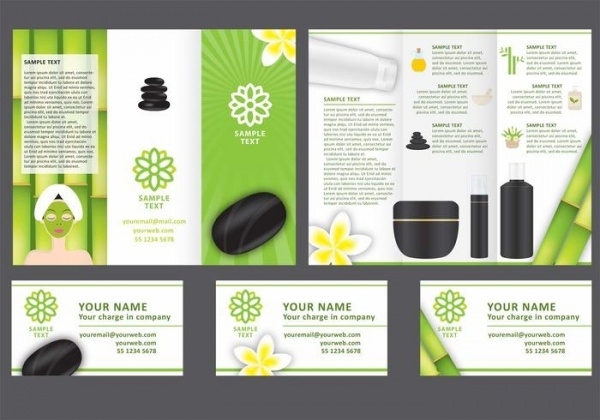 The brochure can use three alternative colors and the fonts can be changed as per requirement. This is available in PDF format for download. 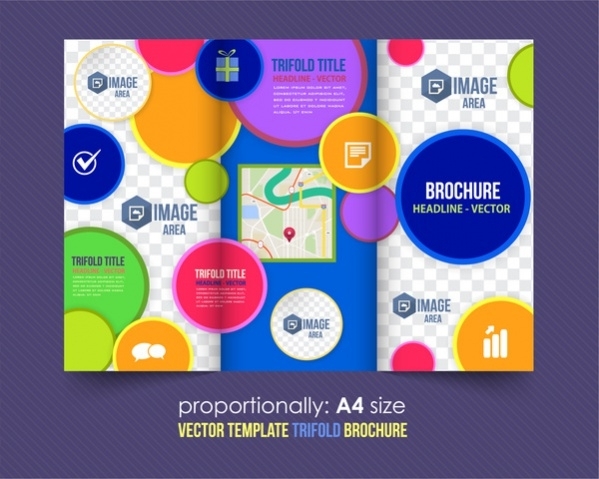 Vector Tri-fold brochure’s design Template Square in shape and size depends on requirement. They are useful as information resources containing the building block of globe and maps along with the biological DNA molecule formation etc. 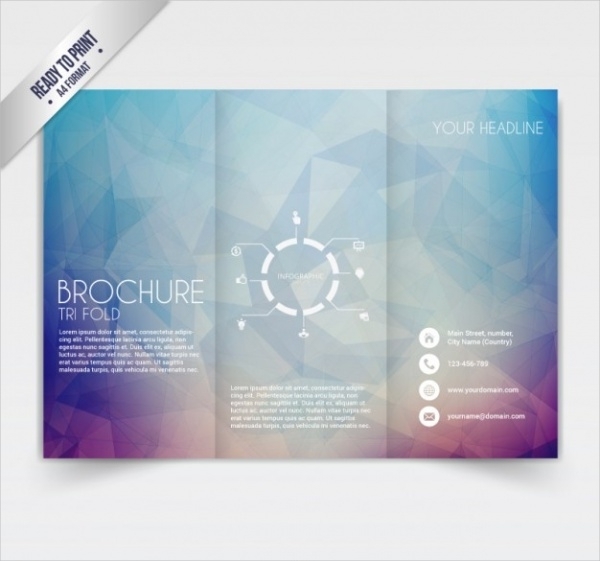 Tri-fold Indesign Brochure Template is a unique brochure available in the size of 8.5 x 11 inches. The images and fonts are 100 % editable with color mode of CMYK. This brochure is easy to use and change as per requirement. 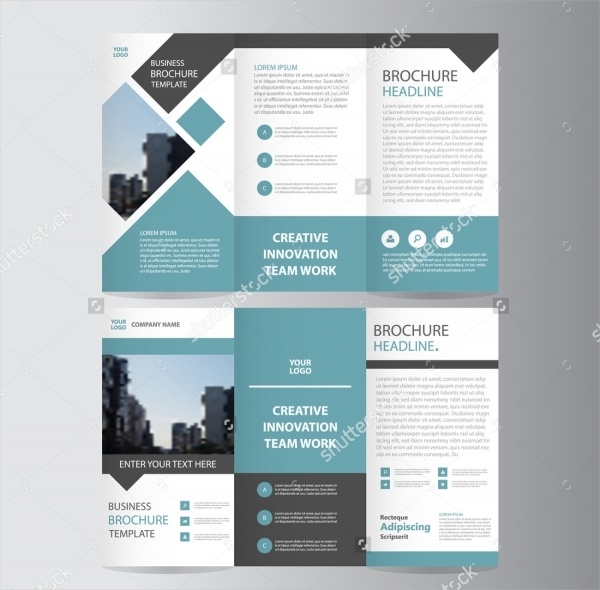 Tri-fold Marketing Brochure is useful in the marketing sector for an institution or corporate business, the brochure is also useful in partnership, marketing and sales. Available in A4 sizes and Armada or Arial font, the color is CMYK. 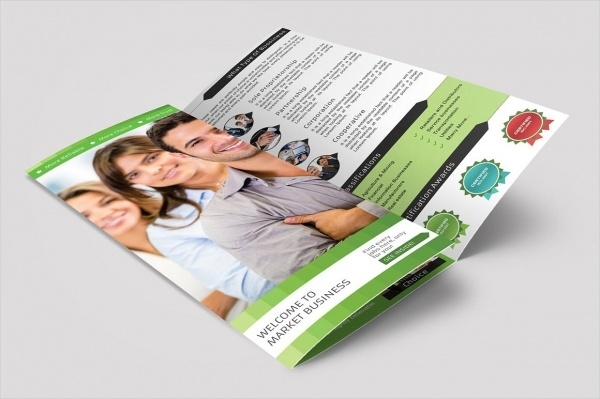 Business Tri-fold brochure is blue in color and square in geometrical size. The Brochure is flat in design and useful in Business Corporation and management as well as sales and expertise. 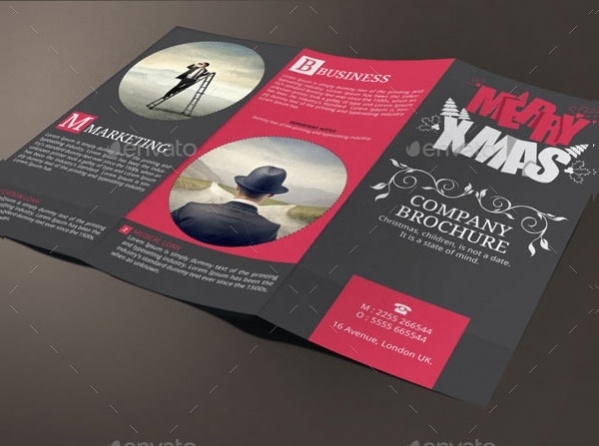 Tri-fold Christmas Brochure is useful for companies dealing in Teaching, Accounting, Fashion, Banking, Education, Festival etc. The Brochure is completely editable available in A4 size of 8.2 x 11.6 inch in the color of Red and Black. The in design template is present in Recto style. PPT presentation is available for download. 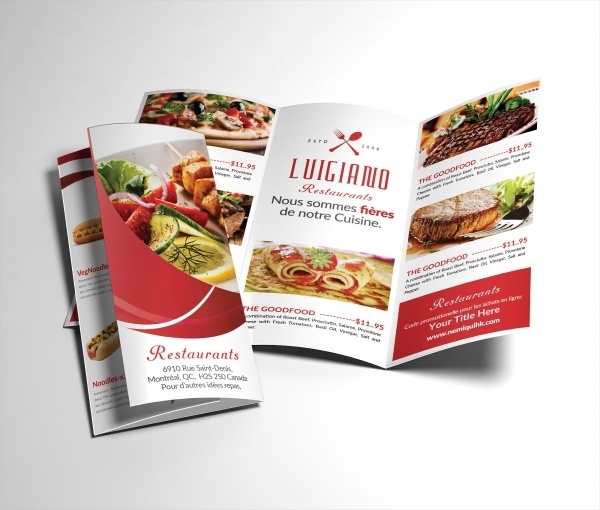 Tri-fold Restaurant Brochure is useful in Restaurant, Hotels, and Bistros etc. The pamphlet includes menu availing food and drinks also different choices of food items. 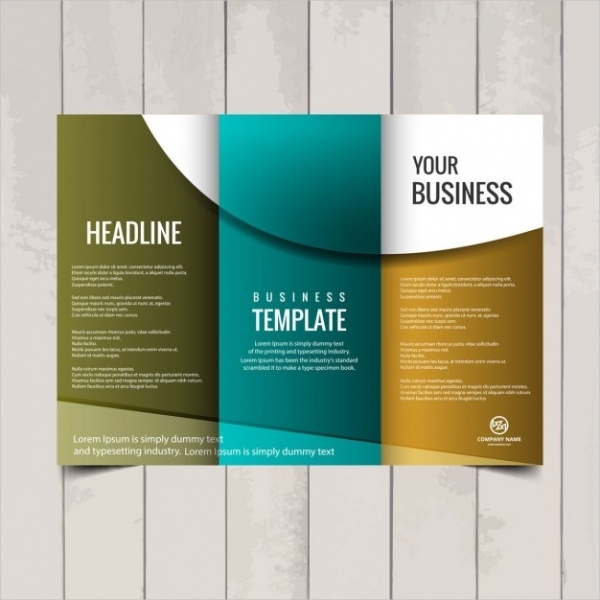 This is a vintage style brochure, can as well be used for Business and Advertisement. Free Printable Tri-fold brochures are useful as Business cards in Marketing, Presentation, Promotional events and as Catalogs. These Brochures are colorful including Brochure template and Cover. 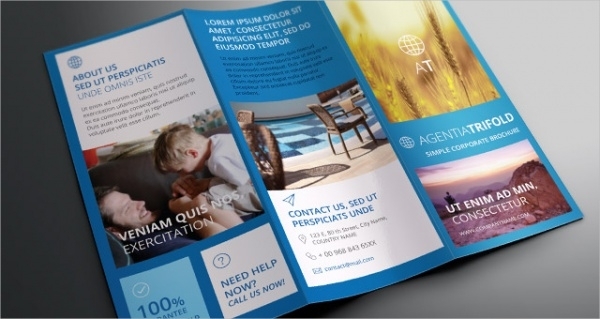 Modern Tri-fold brochures are trendy and modern to use. One can add their own content and images as per their interest and create a beautiful design full of creativity. This brochure is useful in weddings, tourism, spas, and hotels etc. You may also see Modern Brochure Designs. 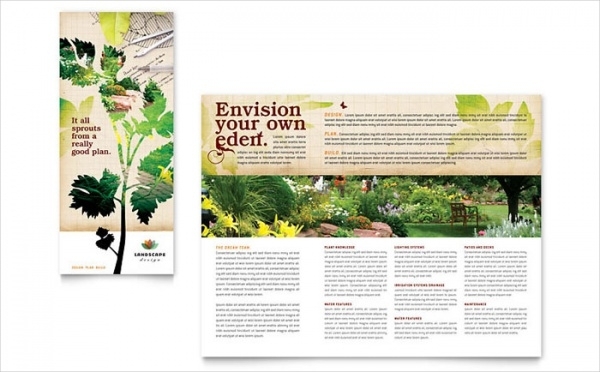 Tri-fold Landscape Brochure is useful as Business Card or Letterhead, gardening brochure, Lawn Mowing service etc. These Brochures are also available in PowerPoint presentation of the size of 8.5 x 11 inches for download. 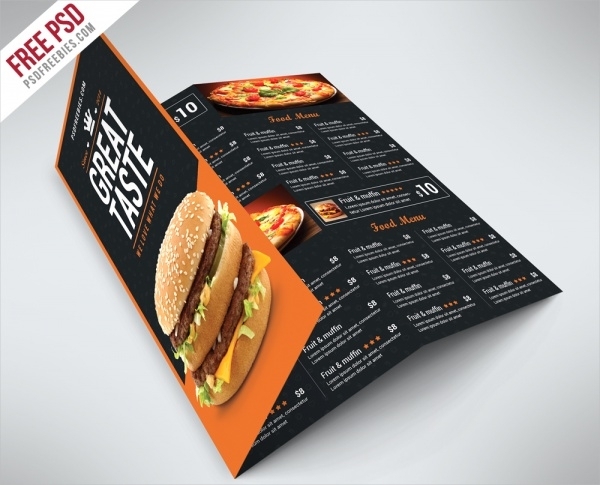 Tri-fold Menu Brochure is useful in Restaurants, Cafeteria, and Fast food menu etc. 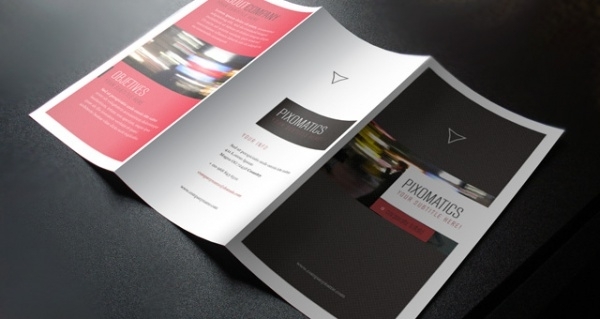 This brochure includes free PSD or 2 PSD file i.e. design on both front and back. They are also layered fully so that one can make changes. It is available for print and download. How to use these “Tri-fold Brochure Designs”? The tri-fold brochure designs can be grouped into different categories in accordance with the requirement. One should use necessary headings and subheadings to group different ideas and contents helping the reader to maintain focus. It should be precise and contain the necessary details to provide adequate knowledge of the event/company etc. The frontal cover can be made attractive and appeal visually with logo/designs and taglines. The back cover is usually unread so email address etc can be preferably listed down on the back side. It is very important to provide significant contact details and language being understood clearly.You may also see Marketing Brochures. Tri-fold brochure free download is available on many sites on the internet including the reputed ones. A number of processes are available such as thick paper or glossy paper in which the brochures can be printed also depending upon the kind of printer used. 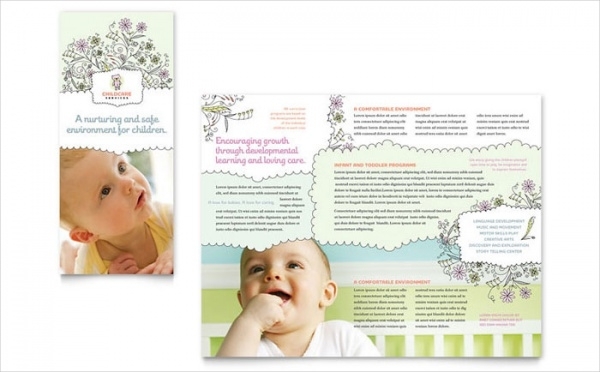 Tri-fold brochure in design helps bring in different images and create graphics in our own way and choice. It as well lets us styles our texts in InDesign’s type tool. 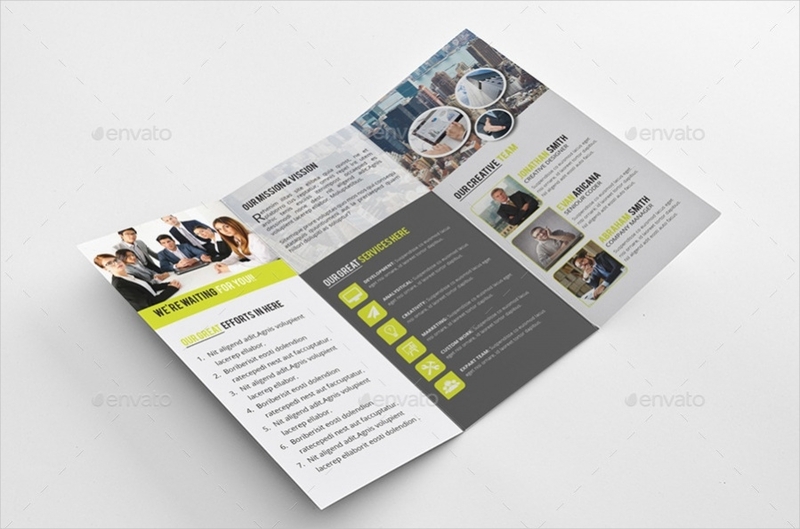 The tri-fold brochure PSD helps create both front and back views in PSD file very stylish by grouping them separately and neatly.